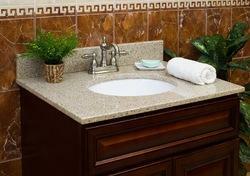 Prominent & Leading Exporter from Jaipur, we offer vanity top, stone vanity top and granite bathroom vanity top. We Yashoda Group Jaipur,Rajasthan based leading exporting unit of Vanity Top. We work on all Indian granite and marble. We are Yashoda Group India are leading exporters, manufactures, supplier, Trader of Granite and Marble products like Stone Vanity Top . We Work on all stranded sizes.